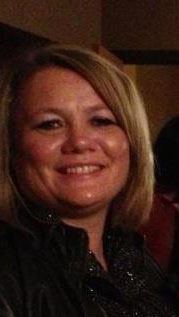 Angi Shumate is owner and director of IDEA House Educational Services located in Canal Fulton, Ohio. She has a degree in Special Education and has taught in the public schools from 1991 till she started IDEA House in 2011. In the year and a half that IDEA House has been open, they have helped 150 plus families. IDEA House started as a tutoring program and became an all-day school within a few months because of need. "I always dreamed of an environment that was tailor made for students to grow and learn in a manner that would best prepare them for adult employment and independence. These kids are accomplishing things each day that may have seemed unimaginable in their previous school settings. To witness that kind of growth is a privilege I never take for granted or stop appreciating." IDEA House is known for reaching the child where they learn. "We are completely different than a public school. These kids are given the best of everything we can offer--provided in a setting that is supportive and most conducive to generalization. We educate the WHOLE child!" Mrs. Shumate is a behavior interventionist, owner and director of IDEA House. She has three children, of her own. All three work at IDEA House, during the summer months. Mrs. Shumate started teaching in 1989. "Since that time, I have worked with hundreds of individuals with disabilities. I have been licensed to teach since 1991 and saw my dream become a reality in 2011 with the creation of IDEA House. Of all the blessings I have been granted, teaching is the one I am most grateful for. When I get into a classroom with students, I feel alive and fulfilled. Thank you for providing me that privilege on a daily basis." Michelle Cahoon has been working and volunteering at local special needs agencies for 15 years. She currently volunteers for ASPIES Greater Akron and Summit County Juvenile Court New Paths Committee. Michelle has had extensive training in community resources. She lives in Portage Lakes with her husband and son Tristan. Tristan is 16 years old and has Autism. Education and a Master’s Degree from John Carroll University in Supervision. She holds Ohio Teaching Certificates/Licenses in the areas of Special Education, Elementary Education, and Elementary Administration. Juvenile Court for five years and had volunteered for Camp Quality Ohio’s summer camp for six years. Lynn has been married to her husband, Kevin, for three years. She does not have any children of her own but has helped raise her niece, was a foster mother, and has three adult step-children.“I am very excited to become a part of Idea House and all of the wonderful things they do on a daily basis to help promote academic, social, and emotional growth in children with Autism”. Leia is married and the mother of 2 children, a 13 yr. old son and 9 year old daughter who both attend Green Local Schools. 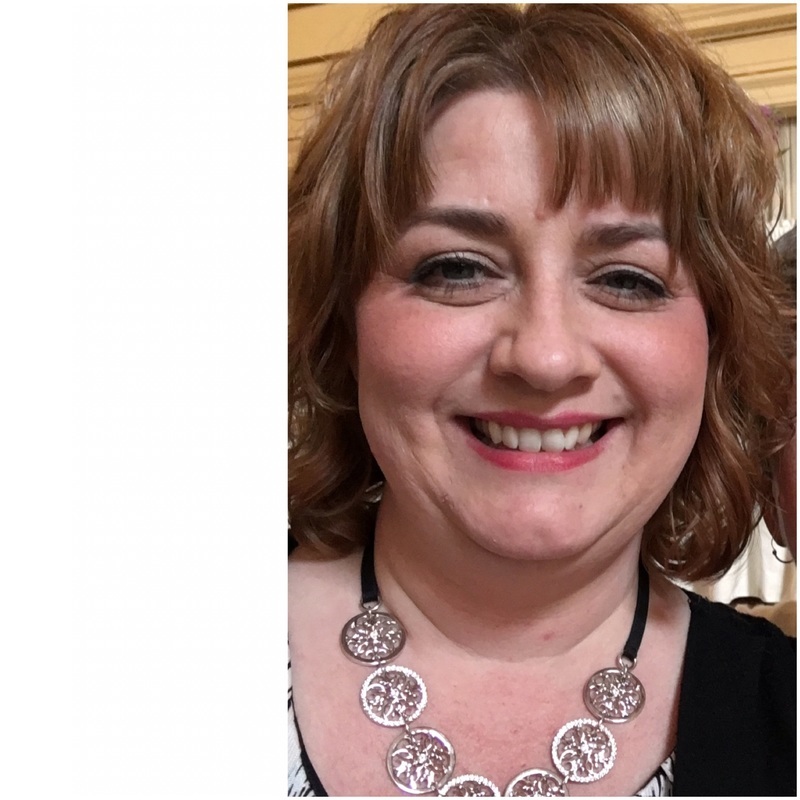 She graduated from the University of Akron in 1999 with a Bachelor's of Science in Education, majoring in Special Education and is a behavior interventionist. She has worked various jobs over the years, ranging from working with adults with disabilities in a group home setting to foster children in a group home setting to substitute teaching in Green Local Schools and an inner city charter school to hospice/home health care. She is extremely excited to have the opportunity to work with the amazing children, staff, and parents of IDEA House. "The mission and philosophy of IDEA House is amazing, and I love working with the children, not only teaching them but learning from them as well. IDEA House is a very special and unique school that I feel blessed to be a part of, and I am looking forward to a wonderful and educational school year!" Andrea has a BA in Education from Bowling Green State University. She also has a MA in School Counseling from Capella University and HQT in ELA, Math, Science, History, Geography, and Social Studies. She has worked as Community Psychiatric Support for Child Guidance and Family Treatment. She has been a Title One Tutor and Instructional Aide with Severely autistic and multiple handicapped students. She has been a Family Consumer Science/Study Skills Teacher and a Life Skills Instructor for teens and women. My name is Jaclyn Ritch and teaching is my passion! I went to the University of Akron and received my license in Early Childhood Education in May of 2016. Right out of college, I worked in Massillon City Schools in the Title 1 program, specializing in reading intervention, along with alternative instructional strategies in mathematics. Since I've started at IDEA House, I've already made an amazing connection with the students and feel as if I can make a positive impact in their lives. I am extremely excited to start the 2017-2017 school year! Kristopher has a BA in Middle Childhood Education from MVNU, and after he graduated he was able to tutor privately and work in the public schools for almost eight years. He has a big heart for the kids and loves to learn himself. "Working with a small number of students is great because of all the attention I can give them individually." He loves cards, board games, piano, acting and singing in plays or musicals, and loves to continue traveling. I graduated from Kent State in Middle Childhood Education with a concentration in Language Arts and Social Studies. I also have a Reading Endorsement. I enjoy reading and writing. I have been teaching for eleven years and just LOVE it! I am happiest when I am with my family or my second family (IDEA House). When I have time off, I miss my students. People always ask me how many children I have and I say 30. I do not have biological children, but I think of my IH students, as my children. IDEA House students are very respectful. They work very hard socially and academically. It is unlike anywhere else I have taught! It is amazing! Andrea has her BS from Ball State University in biology. She has several years experience working in schools and with homeschool groups teaching upper level math and science. Andrea is currently taking classes towards her Master's in Social Work. Andrea is also the Children's Pastor at a small church in Canton where her husband and two dogs live. I am a mother of three wonderful boys. When my middle son was diagnosed with severe autism. I went back to school at Stark Technological College, to get an associates degree in Occupational Therapy. I wanted to go into a field where I could better understand Autism and work with individuals on the spectrum. After years of working in different school districts and private therapy, I took time off to focus on my son's needs. When I came back to work, I wanted a schedule that allowed me to be there for my kids. I have found I love being an aide. I love seeing the kids grow on a daily basis. For obvious reasons. I have a special place in my heart for all people on the spectrum and want to help them reach their fullest potential. I'm so excited working at IDEA House, I love that the staff looks at the whole child and meets them where they are. I love that they encourage them to be the best they can be! I recently received my Bachelors of Arts in English from the University of Akron where I concentrated on Creative Writing and Popular Literature and Film. I plan on continuing my education in the next year by starting a second bachelors in Adolescent/ Young Adult Integrated Language Arts Education and from there moving on to a masters program. While an undergrad I played Baritone in Akron's marching band and concert band, and I still continue to play in a community band. I also enjoy writing, and have a few short stories published. So far my favorite thing about working at Idea House is seeing how the boys and girls teach each other and teach me. I'm constantly being blown away with their ability to push themselves and inspire everyone around them to have that same drive. It's amazing to be able to light that spark, and just watch them go. 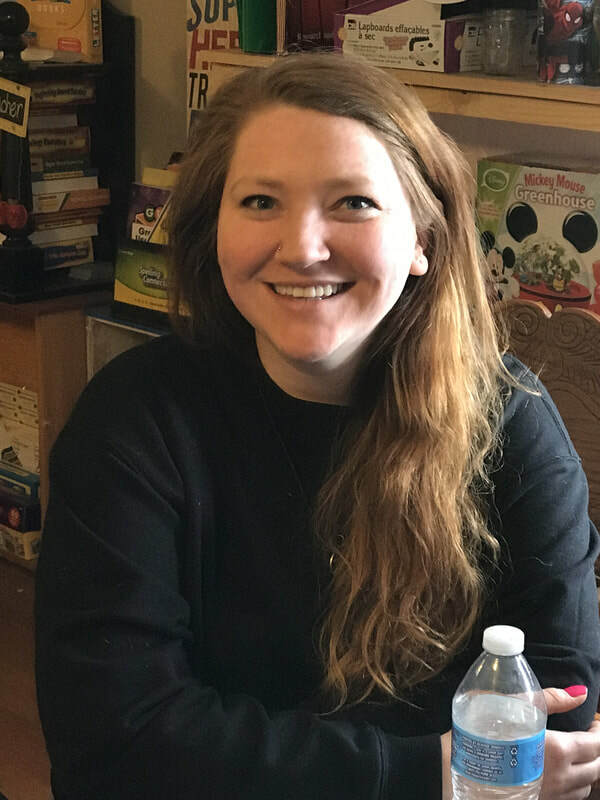 ​Jessica Alcorn has her associates degree in Education at Stark State and is working toward her Bachelor’s Degree in Middle Childhood Education. She graduated from Perry High School. She also works at Old Carolina Barbecue in Massillon. She and her husband Dustin reside in Massillon. She is excited to have the opportunity to work at IDEA house as her first job with students. Everyone here is lovely and she is so happy to be a part of this school. IDEA House. I am looking forward to a great school year! ​Mrs. Tristano has a real passion for our students. She takes all her life's experiences with kids and is able to meet each student where they are. She is a hands on attebdant. She attends to every student amazingly. ​I graduated from Green High School in June of 2016. I am currently attending the University Of Akron and plan on getting a degree in Early Special Education. 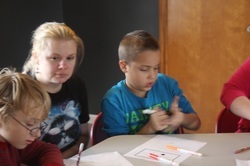 I have worked with children at my church and that is when I realized I had a passion to help them. When I started working at IDEA house I immediately fell in love with my job. I can't wait to go to work everyday and spend time with these students with such creative minds. Amanda is an attendant at IDEA House. 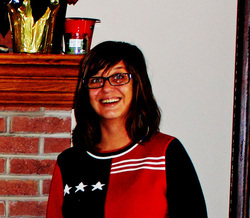 After graduating Manchester High school, she attended Kent State University and the University of Akron while majoring in photography and painting. In her spare time, she accepts commissioned art projects as extra income. She also continues to create personal art pieces which range from drawings, paintings, jewelry, and digital media. During the summertime, she works as Lead Video Editor at a skydiving center. Amanda is working to further her career in education and hopes to become an art teacher. She enjoys spending time with the students at IDEA House and is grateful to be a piece of the puzzle. My name is Scott. I live in Canton with my wife of 33-years. I have two adult children and three grandchildren. I am involved in music ministry at my church. I play the drums and have been a musician for decades. I love being a part of the IDEA House family because it truly is family! 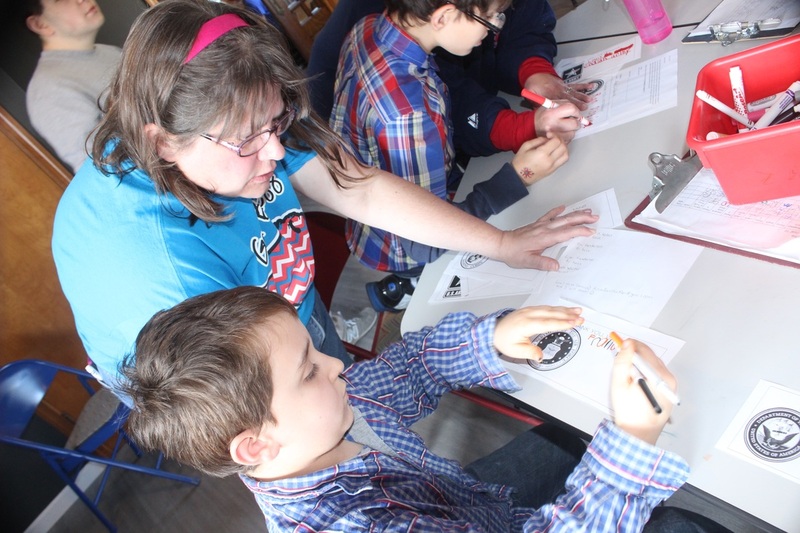 It is an environment where the students really want to learn which makes for a lot of fun for the teachers and staff. I work as a teacher's aide and I can't think of another job I would rather have. I am studying special education at Kent State University. I am a sophomore there and I graduated from Green High School. My working at IDEA House has definitely solidified my decision to start teaching. The staff is very hard working and loving. It is an honor that I am able to work with these amazing students. I am excited to finish school at Kent and hopefully, one day, become a teacher at IDEA House. ​BRADY--RIP to our Service Dog. You are missed! 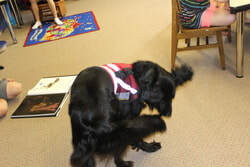 Brady is our service dog. He was given to us by W.A.G.S., an organization dedicated to training and placing mobility service and skilled companion animals for children with disabilities. They are driven by their belief in early intervention. They work with families (and organizations like IDEA House) to place a dog as early in a child's life as there is a need an an interest. Their website ishttp://wags4kids.org/.